The colorful and heavenly Mu Cang Chai terraced rice fields have been mesmerizing numerous nature lovers, especially during the harvest time of September and October. They all come to capture the best aspects of Mu Cang Chai regarding the happy faces of ethnic people, the harmony between the blue sky and yellow terraced rice field that seems to lead us to heaven, and also the peaceful green landscape. 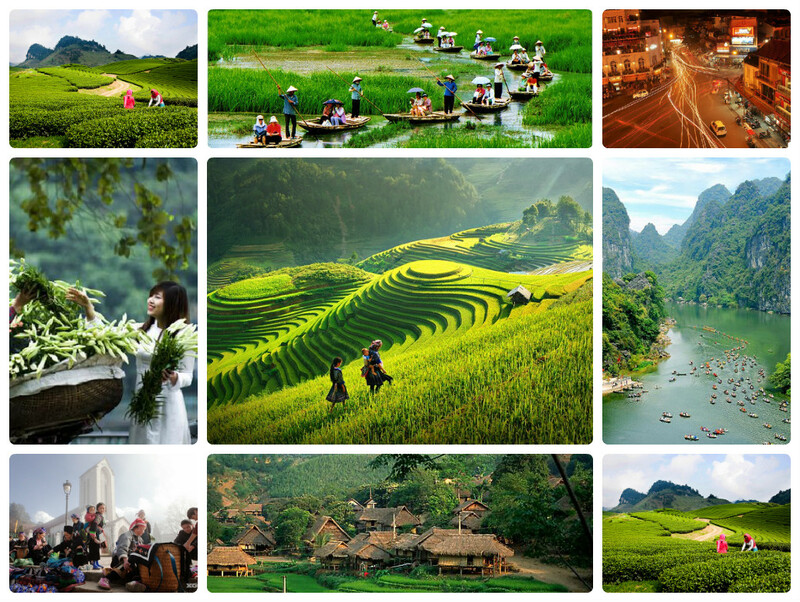 For the successful photograph tour in Mu Cang Chai, do not miss the 10 remarkable places here ! khau pha pass, mu cang chai, vietnamKhau Pha Pass is one of Vietnam’s most twisting passes that run towards Khau Pha Mountain – the highest mountain in Mu Cang Chai area. The pass is surrounded by the grandeur of mountain ranges, the primitive forest and the continuous terraced rice fields of the H’mong or Thai people. The pass challenges adventurers to conquer it and then record its fairy beauty. Since it’s not easy to reach the beautiful top, only the adventurous tourists can do it. Tu Le Town, Mu Cang ChaiNestled in a tranquil valley of Yen Bai Province, Tu Le Village is the favorite stopover to photograph in Mu Cang Chai. During autumn, the village is coated with the vast yellow rice fields, the comfortable fragrance of the new rice, and many Thai ethnic people who preserve their traditional bathing habit. The photographs taken in Tu Le are all dramatic and bewitching. lim mong village, mu cang chaiLim Mong Hamlet has long concealed itself in the clouds for ages. This photography destination is challenging yet inviting with the primeval charm of both nature and people. Most of the tourists love photographing the hamlet and the colorful surrounding from the top view. The pictures become more fantastic if they include some unidentified ethnic people. La Pan Tan vietnamBeing famous for the vast terraced rice fields which are as fabulous as the fingerprints of the Creator, La Pan Tan Village is outstanding. It owns the unrivaled terraced rice fields – the artistic and creative masterpieces of the H’Mong people. Taking pictures of the creative fields, you’ll be mesmerized of their loveliness. Ba Nha bridge, mu cang chaiThe photo hunters like gathering in Ba Nha Bridge. It offers the classical bridge and the uphill road for the stunning shots. The youth appreciates this place much because they can carry out various interesting photography ideas in this fascinating and flattering background. Che Cu Nha village, north vietnamThis is a remote village of Mu Cang Chai town. The road towards the village is quite uphill and challenging, but the view is marvelous. You feel that you’re getting lost in the picture of nature in which the simple houses are put randomly amongst the everlasting yellow backdrop. So, just hold your camera and shoot the amazing scenes! Phu Nhu waterfall Phu Nhu Waterfall is emerged from the springs in the prime forest in Than Uyen (Lao Cai). It has the height of 20 meters and is naturally divided into many levels. The waterfall looks extremely powerful and astonishing enough for you to take the eye-catching pics. mo waterfall, mu cang chai“Mơ” means dream which embodies the fairy beauty of the waterfall in Mu Cang Chai. The sightseeing routes toward Mo Waterfall take you to the dreaming waterfall world. From the bottom to the top of the waterfall, there stands the pristine and magnificent scenery to feast the eyes. You might stop by lots of flattering areas to film when climbing upwards. Thai village, mu cang chaiThe peaceful and pretty village is nestled in the middle of the poetic valley, leaning against the huge mountains. Here, you can capture the truly pictures of peace and tranquility. Then, enjoy the Thai special foods, sleep in the piled houses, and join campfire happily. Lung Lo pass, vietnamThe Pass has been left undiscovered from the Dien Bien wartime, so nature remains totally primeval and charming. All pictures taken in this Pass feature the fresh air, perfect harmony between nature and human. Besides, the simple lifestyle of ethnic people and their unique highland culture of northwest are great bits to expose. 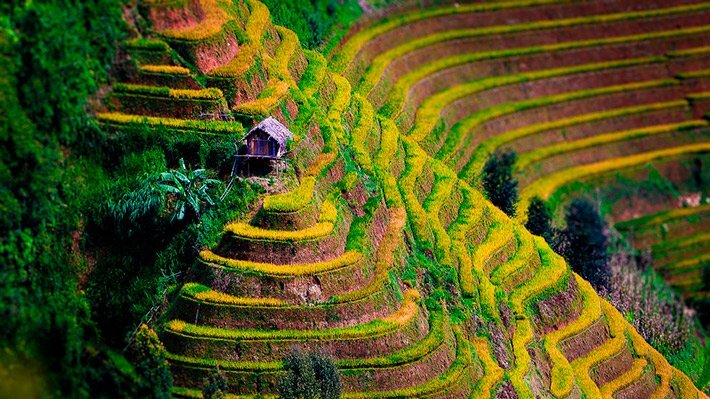 7:00 - 7:30: Pick up from your hotel and depart from Hanoi to Mu Cang Chai (distance: 285 km) follow no.32 road. On the way, we have two break point and you can enjoy some beautiful sightseeings, take photos, short trekking or drink tea, coffee. 12:00: Arrived in Nghia Lo town, Yen Bai province. Enjoy a lunch in a local restaurant, then keep on driving up to Mu Cang Chai. We stop-over in Khau Pha Pass for sightseeing, easy-trekking and take photos of this area. 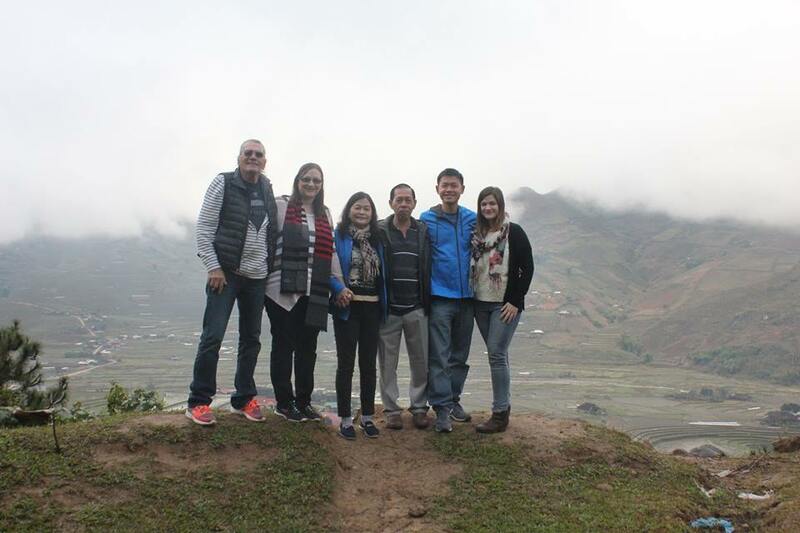 17:00: On arrival at Thai village in Mu Cang Chai district, you are warmly welcomed by Thai people at our homestay. Check in to the room then enjoy stunning views of countryside and nature, visit local villages, experience daily life of hill tribe people. 19:00: Enjoy the special dinner with traditional dishes cooked by Thai professional chef. 20:30: Discover life & culture of Thai people. Experience a homestay night on a traditional stilt house of Thai ethnic. 6:00: You could wake up early for taking photos of sunrise. 8:00: Get a transfer to a trekking point (whole day trekking) to enjoy Northwest Vietnam’s national rice terraced fields heritage. We will start from Ba Nha to Che Cu Nha Commune to Mam Xoi hill (rice terraced fields of H’Mong people) then the driver will take you to La Pan Tan Commune (13 km from Che Cu Nha). 12:30: Rest and have lunch in a H’Mong stilt house with their signature dishes. 13:30: After lunch, continue trekking around La Pan Tan. 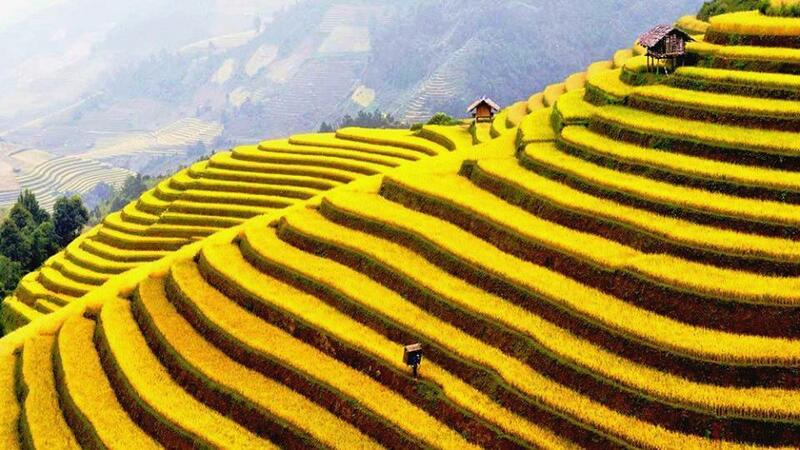 This trek will definitely offer us a good opportunity to see the main spots and admire the beauty of terraced fields that Mu Cang Chai has to offer. We will also be able to visit a few villages of the H’mong hill tribe scattered in the area, play with children and talk with friendly local people to discover their life & culture. 16:00: Transfer to Tu Le Town (40km from Mu Cang Chai). You’ll have chance to see the interesting activities of Thai women in Tu Le making the “Com – green rice” – the famous special product of Tu Le belong your road in the harvest season. 17:30: Check in guest house in Tu Le Town. 19:00: Dinner with local foods. Your leisure after dinner to walk around the town, try to communicate with local ethnic minorities and stay overnight in a private room. 7:00: Enjoy your breakfast at a local restaurant. 8:00: After breakfast, start to trekking around in Lim Mong (Black H’Mong people), Lim Thai (White Thai people) village (5 km) – a beautiful valley located at the foot of the pass. 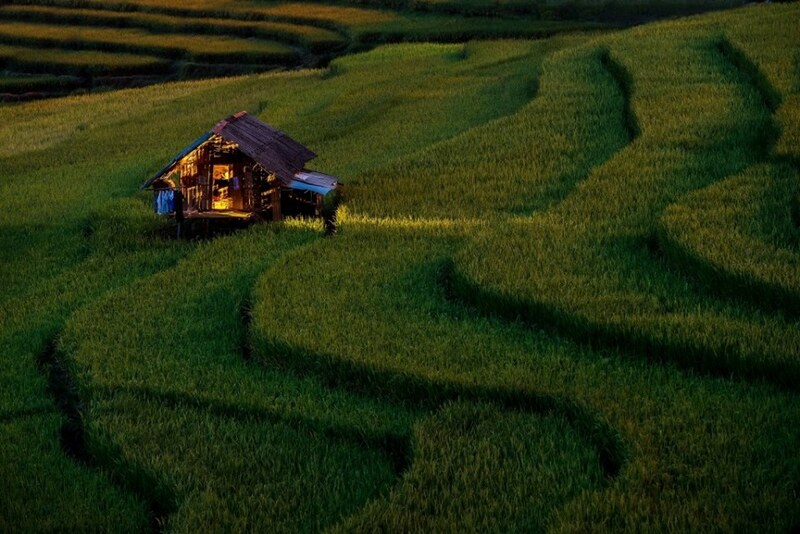 We can enjoy the morning breeze, view the rice terraced fields and the daily life of villagers. The scenery along the way to an incredibly interesting, you’ll stupor before the incomparable beauty of the rice terraced fields – the fruits of H’Mong people for a year. 11:00: Get back on the vehicle and take our return journey to Hanoi. 12:00: Lunch at Nghia Lo town. After that, we come back to Hanoi follow expressway. 18:00: Arrive in Hanoi and drop you off at your hotel. Necessary things: your original passport, sunblock, sunglasses, good hiking shoes, hat, pants/long sleeve clothes, mosquito/bug repellent, personal items. If you are allergic to somethings or diet, vegetarian…please let us know before your departure date. Weather: very unpredictable and constantly changing throughout the day. Often there may be rain at night, early morning fog and sunny daytime sky. You should bring umbrella/rain coat.